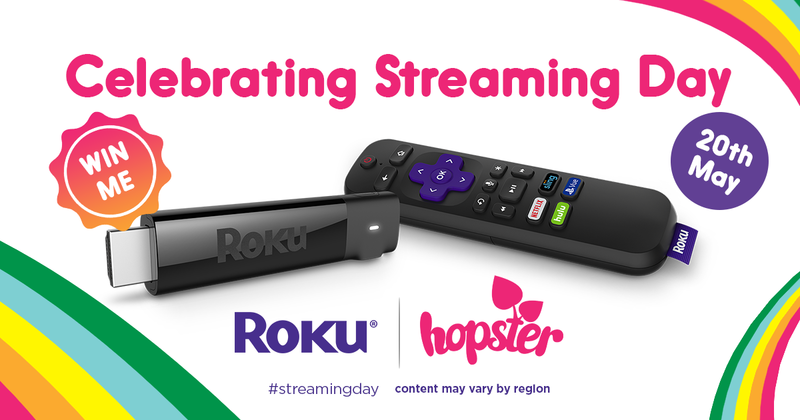 To celebrate National Streaming Day on Sunday May 20th, we’ve teamed up with Roku to give away their 4K compatible Roku Streaming Stick+* to some lucky winners. NB: Content available on Roku differs by territory. US device pictured. Hopster is available as a channel to millions of active Roku users in the US, Canada, Ireland and UK (plus a localised French language app in France as well), which means you and your family can explore Hopster on your TV with one of these Streaming Stick+ devices. Developed with little fingers and big thinkers in mind, the Hopster channel for Roku is colourful, fun and designed to be intuitive for young users. Giveaway open to entrants from the United Kingdom, United States, Canada, and Ireland only. You can submit multiple entries. *RRP $69.99 (US), £79.99 (UK), $89.99 (CA), € 89.99 (IE). There are three devices in total that are winnable in this competition, for the US, CA and GB+IE markets respectively. No entrant may win more than one device. Entries close midnight 3rd June.